The concept for this program began with two 16mm color films shot by Everett Rohrer. 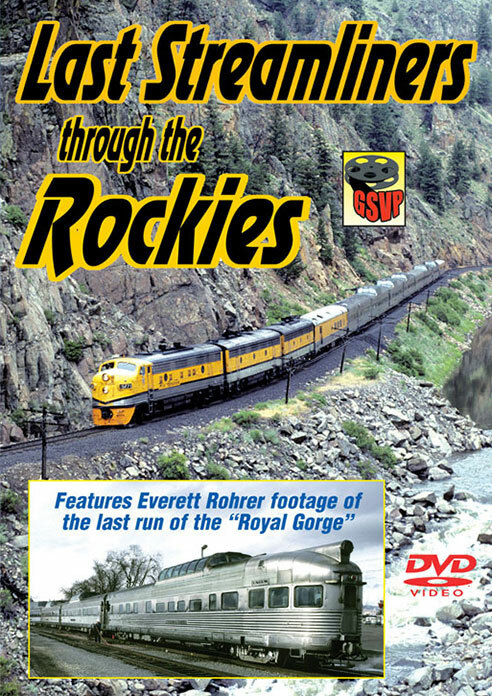 The idea of Last Streamliners is because one film is the last run of the "Royal Gorge" passenger train, which Everett rode and film for posterity. First we see another film shot by Everett Rohrer of a 1970 Winter ride on the California Zephyr with Rio Grande F-units, traversing the Colorado Rockies with snow on the ground in the higher elevations. This is all shot from a dome car, with nice views of the train ahead, the many tunnels, the scenery, and even a meet with the eastbound Zephyr. The next segment is a 1981 chase by Greg Scholl that shows the Rio Grande Zephyr led by F-unit 5771 as we follow it trackside from west of Moffat Tunnel to Glenwood Canyon. This is sound movie coverage, and historic since the train was discontinued in 1983, but 5771 was saved and is at the Colorado Railroad museum today. Our third segment is the Last Run of the ROYAL GORGE passenger train with an F-unit and 3 coaches as heads south of Denver toward Colorado Springs and Pueblo where there are numerous passengers getting on and off. Then the train heads west through the Royal Gorge, where a stop is made for passengers. Then its on to Salida, where the train is turned on a wye, for the return to Denver for the last time. Again we stop at the Hanging Bridge in the Royal Gorge, and this time there is a rock slide. Later our photographer gets a cab ride into Denver Union Station. To finish off this program, we have added scenes of the Moffat Route shot in 1994 taken by Greg Scholl of the California Zephyr between Moffat Tunnel and Dotsero. This includes two different westbound trains, and one eastbound that has three units on it, including a Rio Grande leading. This train is interesting, and includes one of most dramatic bad weather shots on video!!! If all this were not enough we included some footage we got at the last minute that shows some scenes at Pueblo station shot between 1951 and 1953, and includes a couple of steam shots, as well as some scenes of the Royal Gorge Passenger train. All the 16mm film scenes in this program have music and narration since there was no sound on the films of course. However, we do have the 1981 footage with train sounds, as well as the 1994 video we shot. This is a nice cross section of material showing passenger service in the Colorado Rockies. The Rio Grande operated the last Streamlined passenger trains in this region, before Amtrak eventually took over the Denver to Salt Lake Segment. Steamboy (Revere MA US) on 2016-07-26 19:46:44. There are 50/50 Segments from Silent to Sound and Still keeping on with the Zig-Zagging mode. The July 1967 & January 1970 footage from Everett Roher, & Some 1950's clips From Donald Olsen are included with Music, While Greg's July 1981 & June 1994 footage have natural sounds. This was the first time that Greg would release one of his own sound films from his private collection just 3 years before he got started in the video business.